I regularly walk past a building that was once a Blockbuster video store. Most recently it was a dollar store and is now being converted into a gym, but I know it was once a Blockbuster because it still has a Quick Drop slot. With it currently being gutted and remodelled as a gym, my fear is they'll get rid of the Quick Drop slot. It's far too young to be considered historical, so every day I walk by to see if it survived the day. 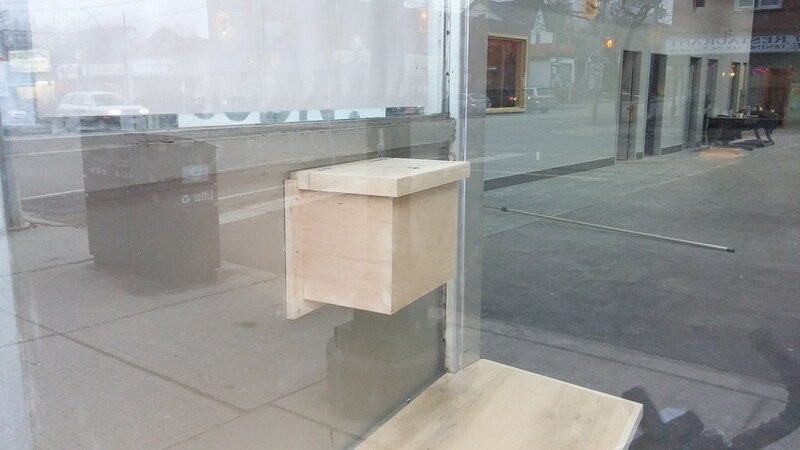 Today I saw they had built a new wooden box on the inside, a sure sign the Quick Drop slot is here to stay. 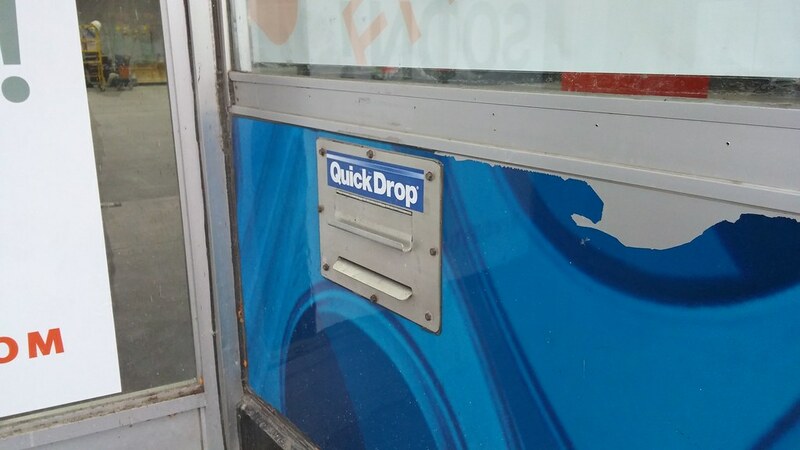 Why would they need a drop box like that at a gym? What's getting deposited in there? No idea, but the box is new! Technically not Mimico, but New Toronto, but definitely on the Lakeshore. L O L. That's funny, but sweet and nostalgic all at the same time. Could it be used as their mailbox? There is a Starbucks in a former bank building at the north end of Roncesvalles Ave (where it becomes Dundas St. W. at a strange kind of intersection) that still has a small bank vault, I think just inside of where there had been a place for deposits to be dropped from the outside, presumably from the time before bank machines existed. I have no idea what possible purpose it could now be serving. Maybe it just wasn't worth the expense to remove it. Allegedly the Boyd Gang once robbed a bank in that neighbourhood, although I think it may have been one in a building across the street that's now a daycare. Next time someone's in the fitness gym I'm going to poke my head inside and ask them what they're going to use the Quick Drop slot for. the bank in that neighbourhood robbed by the Boyd Gang may have been the one that is now the Starbucks at Roncesvalles and Dundas. ^ And, the big metal thing in the corner of the Starbucks, left over from when it was a bank, is obviously a safe. I'm not sure why I called it a vault, other than a brain fart. I spoke to the new owners. They're going to use the Quick Drop slot as their new mailbox.